Westbrook Associated Engineers, Inc. of Spring Green, WI, along with Central Segment Design Team members KL Engineering, Inc. and RA Smith, Inc., was awarded the Wisconsin Department of Transportation’s Excellence in Design Award for Best Consultant Structure Design. Westbrook served as the structural design engineer for the two new I-39/90 Rock River bridges. The $1.2 billion I-39/90 Expansion Project extends approximately 45 miles along Interstate 39/90 from the Illinois state line to the US 12/18 interchange near Madison. The Rock River Bridge project involved reconstructing the existing I-39/90 northbound and southbound bridges over the Rock River from 2-lane structures with 5-foot shoulders to 3-lane structures with 12-foot shoulders, and the ability to expand to 4-lanes with minimal impacts. The new pier and abutment substructure units were designed and constructed to accommodate a future fourth lane on each bridge structure. This key feature added significant long-term value by allowing future widening of the bridges to be accomplished without additional environmental or construction impacts within the river corridor. Westbrook Associated Engineers, Inc. is excited to celebrate the one-year anniversary of the opening of our branch office in Appleton, WI. Since opening the branch office, Westbrook has been able to better serve clients in the region. 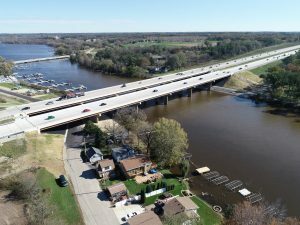 The Appleton office, under the leadership of Erich Masiarchin, P.E., provides a full range of engineering services from road and bridge design to bridge inspection and construction administration. For more information, contact Aaron Palmer at (608) 588-7866. 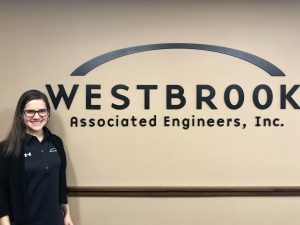 Westbrook Associated Engineers, Inc. is pleased to offer an annual scholarship to graduating high school students from local school districts. Our desire is to support and encourage local students who are pursuing a civil engineering related career. In 2017, Lindsey DeYoung, of Richland Center, was awarded the Westbrook scholarship. This year, Westbrook is pleased to have Lindsey joining us for a Spring-Summer Co-operative Education opportunity (Co-op for short) through UW-Platteville. The UWP Co-op program allows engineering students to earn two Credits while gaining valuable engineering experience on a semester assignment in a real-world engineering position. We are happy to have Lindsey with us this semester, and we trust that the experience and knowledge she gains during this time will be valuable to her in the future. Current high school seniors from local districts have until April 1 to submit their applications. Westbrook completed oversight of a WisDOT construction project on STH 35 in Prairie du Chien this past summer. The project included reconstruction of 1.5 miles of STH 35 through a heavily populated business district of Prairie du Chien. The project consisted of removing the existing roadway, reconstruction of the storm sewer system, sanitary sewer, water main, lighting, traffic signals, sidewalk, grading for the new roadway, as well as concrete paving of the new roadway. Coordination between the prime contractor (Gerke Excavating) and all of the subcontractors, city of Prairie du Chien officials, business owners, residents, and WisDOT representatives was crucial during construction as the roadway was constructed in 3 phases to allow traffic flow to and from businesses and residences between phases. STH 35 was opened to traffic by the contract completion date with minor work (asphalt paving of the multi-use trail and restoration) to take place in the spring of 2019. In the summer and fall of 2018, Westbrook assisted WisDOT in the construction administration for a 0.710 mile urban reconstruction project on E Division St/USH 191 in the City of Dodgeville, WI. Westbrook was on-site daily providing construction oversight and project managerial duties. E Division St/USH 191 from Iowa St to Diamond Oaks Dr was completely reconstructed. The existing water, sanitary, and storm facilities were removed and replaced. Additionally, the existing roadway was completely removed and a new asphaltic roadway consisting of two driving lanes, one bike lane, and a parking lane was constructed. The existing sidewalk on the south side of the project was removed and replaced to comply with ADA requirements and an additional sidewalk was constructed on the north side of the roadway as well.